Pour your brownie mix into the baking tray, and place in the oven for around 25 minutes based on Jamie's original recipe for a very gooey centre(see next 2 paras on the baking times for different textures). You don't want to overcook them so, unlike cakes, you don't want a skewer to come out all clean. The brownies should be slightly springy on the outside but still gooey in the middle. If you like it really gooey inside, 25min of baking is enough. A skewer poked into the centre will come out sticky. You may allow it to cool in the tray before carefully lifting the grease proof paper with the slab of brownie out, transferring to a large chopping board and cut into chunky squares. However, if you prefer it to have a crispier top and just slightly gooey centre, bake it for 25min then remove from the oven. Allow it to cool in the tray for about 15mins then put it into the oven again at 150°C for another 8-10mins. 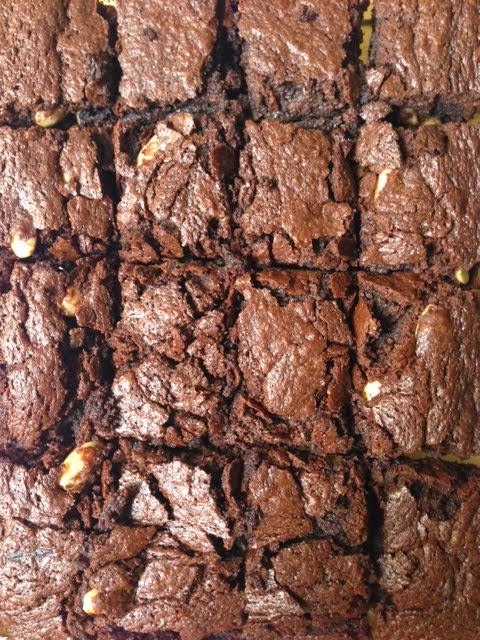 Allow to cool in the tray before carefully lifting the grease proof paper with the slab of brownie out, transferring to a large chopping board and cut into chunky squares. These make a fantastic dessert served with a dollop of crème fraîche mixed with some orange zest.